WBSC Secretary General Beng Choo Low spent the whole of Thursday, 14 March, in Vientiane, the Capital City of the Lao People’s Democratic Republic. The visit was a follow-up to the historic participation of the Laos Baseball National team in the Asian Games 2018. 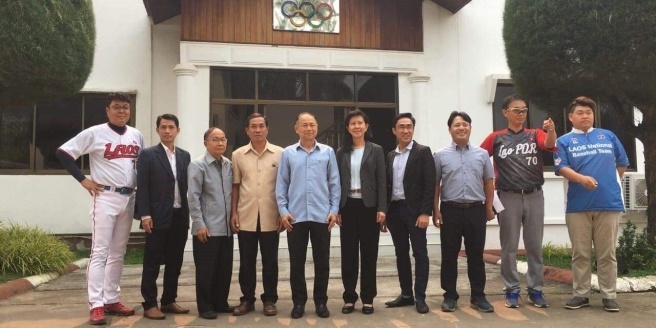 In the morning Beng Choo Low met Somphou Phongsa, Vice President and Secretary General of the National Olympic Committee (NOC), Kasem Inthala, Vice President of the NOC, and Sengphone Phonamath, Head of Elite Sports Department, Ministry of Education and Sports. The Ministry of Sports and the NOC confirmed their support to the Baseball National Team, that will participate in the South East Asian Games 2019, to be played in the Philippines. During the meeting, Beng Choo Low discussed with NOC and Government officials also promotion and development on baseball, softball and Baseball5. The Laos Baseball Federation (LBF) announced that they intend to form a Women’s Baseball National Team and that Baseball5 will be introduced in schools. The day for WBSC Secretary General went on with a meeting with LBF officials: Vice President Bounheng Southichak, Director of Corporate Relations Sung Juh Ahn. Je Sang Uk, founder and principal of the Lao J Brothers training centre, also joined the meeting. In the afternoon, she attended the training of the teams at the Lao J Brothers Training Center, where they started the practice of Baseball5. The Lao J Brothers training centre is key to baseball development in the Lao People’s Democratic Republic. One of the instructors is Lee Man Soo, a former catcher who became in 1984 the first-ever player in the Korea Baseball Organization (KBO) to hit for the Triple Crown and is thus nicknamed The Babe Ruth of Korea.